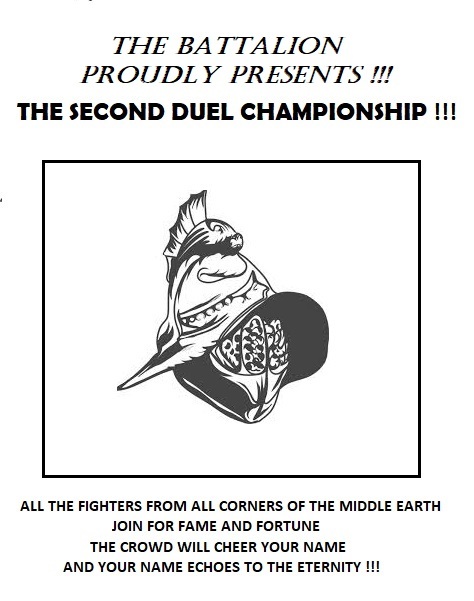 Its a Duel Tournament event.You have to create a lvl 10 guardian or champion for to join or you can come as a spectator.All races are welcome as long as you have a reason to be in Gondorian region. 1-Class: Only Guardians and champions allowed. 3-Race: Any race can join. 6-You can use any kind of cosmetics in a proper rp style. 7-Duels will be ingame duel system. 10-Please send ingame mail to Maxem with your tournament character name before the event date. 11-Even free to play accounts can join without any limitations. 12-You can use your 2 class skill points anything you like. SUMMARY: Its a special tournament for the citizens of Gondor to entertain them.You see the posters of it in your region. Last edited by Wolt; Jan 02 2019 at 03:07 AM.